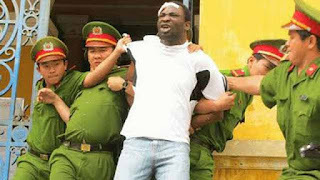 Three days after Chijioke Obioha, a 38-year-old Nigerian, was executed in Singapore for drug trafficking,which gave graphic details of the plights of over 2,000 Nigerians languishing in the Chinese prison. Obioha was hanged in Changi Prison early on Friday morning alongside a Malaysian national, who was convicted on separate drugs offenses. He was arrested in April 2007 after being found in possession of more than 2.6 kilogrammes of cannabis. The quantity surpassed the 500 grammes threshold that triggers the automatic presumption of trafficking under Singaporean law. According to him, many Nigerians have been incapacitated owing to the daily torture meted out to them by prison officials, while a lot more are on death row waiting for the hangman. “One of the most commonly forms of torture is the shocking treatment where inmates are given continuous shocking from an electric device for up to two hours. When going through this procedure, most of us urinate and defecate on our pants. Some people, who have spent some time there have developed brain damage or some form of mental problems,” he said. “Many of us have a very heavy sentences of death and life imprisonment. Some of us have spent over 15 years in prison. We want our home government to come to our aid. We are being treated like animals, mostly Nigerians and other Africans. “The only reason many of us have not committed suicide is the hope of being transferred some day to our home country. Some countries such as Ethopia, Senegal, Iran, Jordan, Colombia and Yemen have started taking their citizens back home and we believe the Nigerian embassy is fully aware of our plights but has refused to take any action. Danny Cancian, a New Zealand national, was released from the jail last year, and was quoted in an article as saying for the four years he spent locked up in Dong-guan, a stint during which he didn’t see the sun or the stars, “there were people hanging themselves every week. They had to take all the wire clothe lines out of the cells,” he said. Based on his account, six days of every week, prisoners would be marched at 5:00a.m. to a factory next door to the prison — after a breakfast of rice water — where they would work until 8:00p.m.